Several years ago (read, eight or more) I went to a concert in Boston. It was a concert by two of my favorite artists at the time: John Mayer, and Bonnie Raitt. They were performing together to benefit the Songbird Foundation. The Songbird Foundation seeks to raise awareness about the importance of fair trade, shade grown coffee, and its effects on songbirds. Here’s what happens. Traditional coffee growers cut down hundreds of acres to grow coffee in full sun. And, they’re deforesting hundreds of thousands of acres of land that songbirds from the United States and Canada depend on for the winter migration. 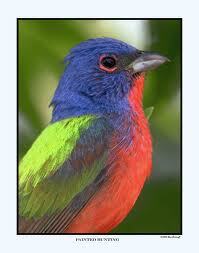 These birds, which include the Painted Bunting pictured above, depend on these forests when they migrate south. Imagine travelling thousands of miles to find a sanctuary you’re sure was there, only to get there and find it’s been destroyed. What do you do? Where do you go? This is what’s happening all over Central and South America. And this is why, when you purchase fair trade, shade grown coffee, you give a lifeline to these birds, many of which are on the endangered list. See, shade grown coffee can thrive under the rainforest canopy; those trees don’t have to be cut down in order for the coffee plants to grow. So, everyone wins! The growers get a fair price for their beans, the rainforest stays intact, and our songbirds have a safe and healthy place to migrate during the winter months. I can’t tell if the Songbird Foundation is still active or not; I searched online and never found their exact website. But I do know that the concert I attended to benefit the Songbird Foundation changed how I looked at coffee, and it educated me on the importance of buying shade grown, fair trade coffee.